The town's cobbled streets offer much to explore, and you'll have the best view possible for the pomp and grandeur of the Changing of the Guard. Immerse yourself in history in a unique location. Castle Hotel Windsor is an elegant Georgian building with a rich past and an enviable address: directly opposite Windsor Castle. Walk through the doors and walk back in time, as you discover fascinating authentic features and lovingly restored décor, before you retire to your gloriously relaxing room. The town's cobbled streets offer much to explore, and you'll have the best view possible for the pomp and grandeur of the Changing of the Guard. With its world-famous Castle and superb Thameside location, Windsor has a rich mix of history, culture, heritage and fun. With year-round events, superb shopping and dining, the area has something to suit all tastes. Our 108 bedrooms follow the Georgian elegance of the hotel. Each one has been beautifully decorated with a refined take on contemporary design, and guests can stretch out on delightful beds covered in the finest Egyptian cotton. Complimentary accessories, such as luxury Lanvin toiletries and fluffy bathrobess are provided so that guests can truly relax. The Marco Pierre White Steakhouse Bar & Grill pairs hearty grill dishes with a wide selection of wines & cocktails from the bar. The menu is filled with old British classics, ranging from steak, warming pie dishes & nostalgic desserts. With simple, elegant and inviting decor, the Marco Pierre Bar creates an ambient atmosphere with contemporary lighting. 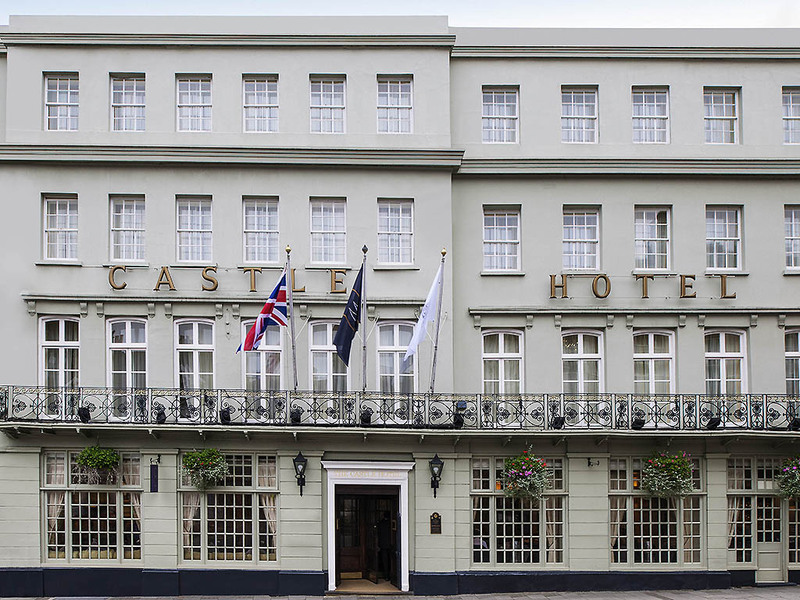 The intriguing artwork brings the rich history the Castle Hotel to life. We offer a wide selection of wines & cocktails. We were extremely happy about our stay at the hotel, mainly thanks to the perfect service of the personnel, who could not have been accommodating. The place is really gorgeous and so well located for visiting the surrounding town. Very good room right next to shops restaurants and castle. Lovely clean rooms, wonderful staff, fantastic location and good breakfast. Also, if you are driving there is parking on site for £25 per 24 hours, which is pricey but very convenient. The only complaint we have is beer on tap in the hotel bar is horrible, on bar menu it says it should be Birra Morretti but it's actually something like Foster's (don't remember exactly). Lovely stay again at the castle hotel . This is the third time we have stayed at the castle and would definitely stay again. Standard of rooms and facilities are very good along with the service. Pleasant amidst a useful environment.Being able to park my vehicle in close proximity to the hotel was an added convenience. Great location, nice breakfast, okay room, horrible accessibility to the rooms. The accessibility to the room is such a pain (luggage up and down the stairs) that if it were not for the location, or availability, I would not book again. Relaxing break in a well appointed and friendly hotel. The size of the hotel is misleading from the front. It is spacious, tastefully modernised and presented on the ground floor. Reception on arrival was welcoming. Good choice for breakfast and of good quality. There was only one person on duty when we visited the bar. They worked hard to accommodate customers but there was a long wait before they came to take our order. The room was clean and comfortable but a big disappointment that there was a ‘window’ in name only though given the ‘view’, understandable (room 18). One would expect this for a cleaning cupboard. To be really honest with the paying guest, it would be open to state on the web-site that some rooms do not have windows but that is not going to happen. The size of the shower meant the screen was too short, so water soaked the floor. One of the worst places I've stayed in a long time. Dated, dirty, cold and not very welcoming. Place needs a full rethink. room was lovely, cups in room dirty though, had to wash them on arrival, one had dried milk in it. check in took a long time, very long queue at the temporary looking reception which was a table and an ipad ! not enough reception staff, all staff looking very busy wandering ab out instead of booking guests in. every time i went to reception there was either a long queue or no one staffing it ! My husband and me went to your hotel for our anniversary and I have to say that it was an absolute pleasure. As soon as we arrived we were amazed with the excellent customer service of the receptionist called Bruno. We went to the room and we found a plate with chocolates and fruit, and also a card wishing us a happy anniversary. The breakfast was absolute great, food good and perfect service. I remember specially a person called Casanova for his professionalism, going an extra mile at all times. Also I would like to say that the allocation of the hotel is perfect for visitors of the city but nothing compare with the service. Thanks for your hard work, your help at all times and your excellent service. The room was quiet, very clean and very well attended. Despite the elaborate good quality furnishing, the room was very small and felt claustrophobic . Lovely,great reception staff, everything really nice. Exceeded expectations in every way - but the staff are the stars! We had a wonderful time. The hotel is extremely comfortable and spotlessly clean. The food was fresh, full of flavour and beautifully presented. The staff were, however, the absolute highlight - without exception they were friendly, professional, helpful and charming. A very clear sign of an excellently managed hotel. We are very grateful indeed that you made our family of 15 aged between 5 and 75 so very welcome! The room was kind of bland and lacked light but being on High Street was very convenient. Nice bar and restaurant area. Very pleasant stay, nice room,very quiet with a lovely comfy bed.All the staff were very welcoming and helpful and had our rooms ready quickly for an early check in. Staff were very attentive and helpfull. Hotel very comfortable and great location. We will return in the summer.